The Moravian G0-2000 monochrome CCD camera has bigger sensor (1600x1200 resolution) and with smaller pixels than the G0-0300, all in the same lightweight and compact body. Also available in color, the monochrome version offers greater sensitivity so it is more suitable for use as guider, for planetary imaging in infrared or ultraviolet ranges (adding a UV or IR Pass filter) or to H-alpha Sun imaging. The robust construction, compact size, low weight and simple user friendly software also make it perfect for those looking for a CCD camera to get started in astrophotography. The Moravian G0 series is based on Sony ICX CCD sensors. Cameras are powered from the USB so they are connected to the PC with only single cable. For this reason, G0 cameras do not require any external power supply. G0 cameras incorporate a standard 6-pin connector autoguider port that allows the camera to directly connected to the telescope mount. 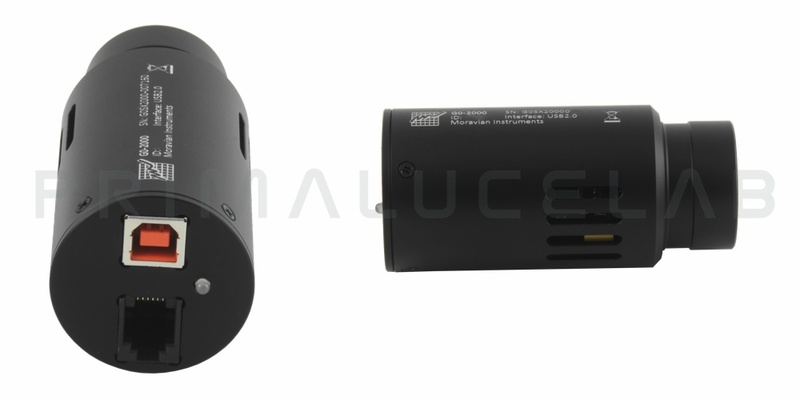 G0 cameras have similar dimensions of an ordinary 1.25" eyepiece and are very compact, lightweight and easy to operate.